When a little-known book first shows up on Amazon, it's a bit like a teenage boy: gangly, awkward, and immature. The "Editorial Review" section is empty or poorly populated. The "Look Inside" feature is not working. The tie-in between the print and Kindle editions is not yet recognized. There are no "other" books which have been viewed by the same people who viewed "this" book. Amazon does not yet offer the hefty discount. It takes time for these things to work themselves out. Anxious parents must be patient. Initially, there are no reviews by readers. A bit later, the first reviews begin to trickle in. If the book is controversial, the initial reviews will be from proponents of one side or the other. The first reviews of our book were from a friend of the defendant's family (5 Stars), someone associated with the victim's family (1 Star), one of our early readers (5 Stars), and someone we suspect is a friend of a friend of the defendant (5 Stars). We recently received the first review from someone that seems to be completely independent. Since we are partial to our own book, we were of course interested in this initial independent review. It's from someone identifying himself as He Loves to Read "Book Lover". He titled his review "Brilliant!". [Thank you for the exclamation mark.] He gave the book 5 Stars. We repeat his review below. Having read the other reviews let me disclose that I am not related to anyone involved in this case, including the author, editor or publisher. I also am not an activist. I might be if I had the energy, but let's face it, I don't. I love to read. 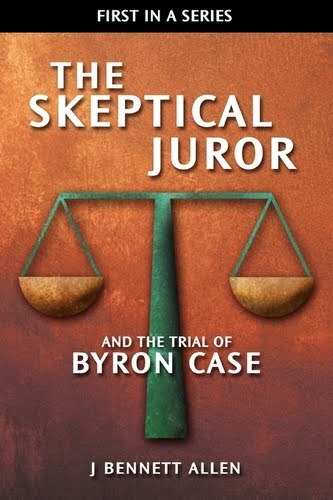 I read at least a little from a book every day..."The Skeptical Juror, And the Trial of Byron Case" was my latest. Once I began to read this work I read it very slowly. I found myself wanting to absorb as many of the facts as I could. J. Bennett Allen had created in me a desire to participate in the process I was reading about. 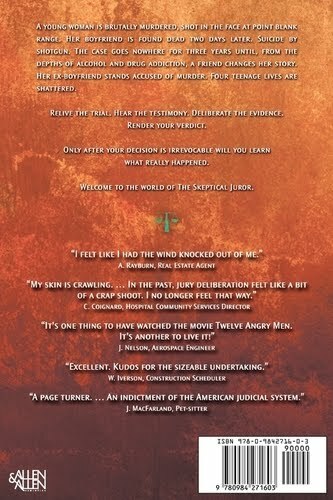 The book had a fantastic rhythm that captivated me as I went through the process with the other jurors. I already knew the results of the jury deliberations (I seem to be using that word very loosely). But I was still shocked at the end of the book. What a terrifying look at our judicial system. This should be required reading for anyone that might serve on a jury. Everyone else should want to read this. It will open your eyes as it did mine. The reviewer got the book for a song, having purchased the Kindle edition. I purchased a Kindle II for the Skeptical Spouse as a surprise gift just after it came out early last year. I'm not sure she has yet let it out of her sight.